Imagination is cheap as long as you don’t have to worry about the details. No matter how smart you are, you’re smarter if you take the easy ways when they are available. If nobody cares, then it doesn’t matter what happens to flowers. Daniel Clement Dennett III was born in Boston, Massachusetts. He is an American philosopher, professor, writer and cognitive scientist whose research centers on the philosophy of mind, philosophy of science, and philosophy of biology, particularly as those fields related to evolutionary biology and cognitive science. He received his Bachelor of Arts in philosophy from Harvard University in 1963. In 1965, he received his Doctor of Philosophy in philosophy from the University of Oxford. In Darwin's Dangerous Idea, Dennett writes that evolution can account for the origin of morality. 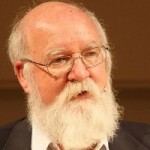 In his 2006 book, Breaking the Spell: Religion as a Natural Phenomenon, Dennett attempts to account for religious belief naturalistically, explaining possible evolutionary reasons for the phenomenon of religious adherence.